batter should be like vada batter. Let it rest for 15-20 minutes. 3. Now add pinch of baking soda and one tsp of oil. Mix well. till golden brown. Fry 5-6 gotas/pakodas at a time. 5. 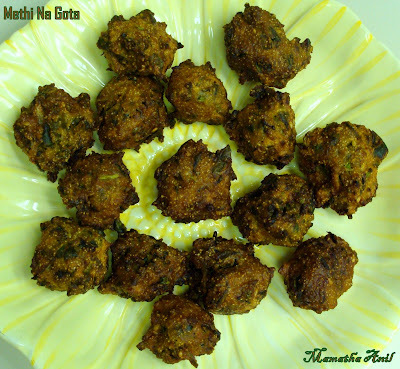 Serve methi gotas/pakodas with chutney or ketchup. Note: "Methi na Gota" is one of the famous Gujarathi snack.